These are the processes involved with withdrawing cases and individual compact activities. The function to withdraw an entire case is now separate from the function to withdraw an individual activity. This change allows users who submitted an activity i.e. Transfer Request, Violation Report, Case Closure, etc. ; to withdraw that activity while leaving the case active. Both withdraw functions are accessed from the Offender’s Profile Screen under the Compact Cases Tab. A Withdraw Button is available for the Sending state’s assigned user which can be found in the Action column of the Active Compact Cases table. The option to withdraw an entire case is available from the time a new case is initiated until the notification of arrival for the case is submitted. 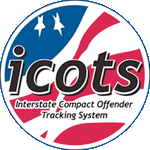 Once the Notification of Arrival activity takes place, supervisory authority within ICOTS transfers to the receiving state. After the notification of arrival is submitted, removing an entire case from the active workload is executed via the Case Closure process. In the above example, selecting Withdraw will remove the entire case and any pending activities from the action items for the offender. Cases that are withdrawn can be accessed by selecting the “Show Historical Cases” box. Users can now withdraw an individual activity without withdrawing an entire case. Withdrawing an “individual activity” will only withdraw that one activity except when withdrawing a Transfer Request or a Request for Reporting Instructions which will also include its reply. ICOTS will add a notation in the activity history and any associated users for the case will receive email notifications regarding the activity withdraw.